After 30 years of terrorizing doll-phobics in theaters, on VHS, and, most recently, on DVD and streaming, Chucky the killer doll might finally be coming directly to TV. Bloody Disgusting ran a piece this week in which they talked to original Child’s Play writer Chris Mancini, who says he’s working with long-time series producer David Kirschner to create a TV version of the pint-sized killer, complete with star Brad Dourif on board to lend his voice to the malevolent doll. 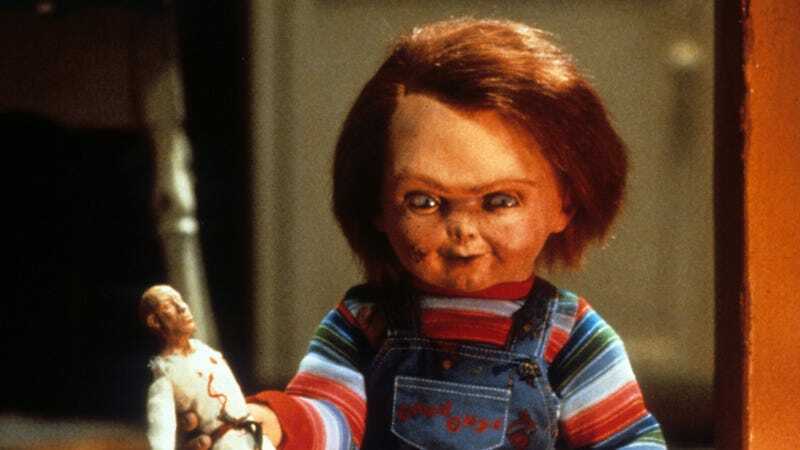 According to Mancini—who also directed the latter installments of the film franchise, from 2004's Seed Of Chucky through last year’s Cult Of Chucky—the planned eight-part series will take a step back to the character’s darker roots, before the films took a full-on dive into comedy and meta-commentary. (Dourif himself had some interesting thoughts on the series’ relationship with humor in our 2016 Random Roles interview with him.) Kirschner has stated that the project will be a continuation of the series’ elaborate voodoo doll cosmology, not a reboot. Besides his Child’s Play associations, Mancini has worked on a couple of high-profile TV projects in recent years; he wrote a few episodes of Hannibal, and has lent his talents to Syfy’s creepypasta anthology series Channel Zero. So far, his Child’s Play show has yet to nail down a channel to serve as its home, but, like the spirit of Charles Lee Ray himself, it’ll presumably be utterly relentless in its pursuit of a permanent host.